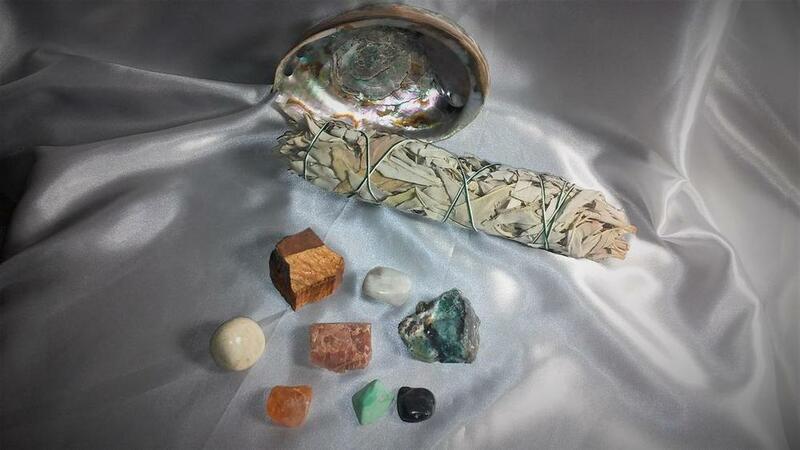 Deluxe June Collection - Moonstone, Tigers Eye, Citrine, Variscite, Agate, Blue Sapphire, Rainbow Moonstone, Serpentine, & a Abalone Shell with a Sage Bundle or a pack of Palo Santo. Has all the properties white moonstone, with an extra focus on emotional aspects. Extra soothing for women. Helps heighten sense of self-worth & value. Promotes emotional healing. Supports the heart. Soothes emotional issues. Brings out the best in people. Helps to eliminate any worry or fear we may be carrying around. Relieves stress. Supports the digestive &reproductive systems. Ability to balance hormonal & menstrual cycles. Promotes spiritual & psychic opening. Promotes acceptance & openness, learning to trust yourself & others. Promotes the Divine in all situations. wisest choices in life, & even enhances the wearer's ability for second-sight or prophecy. Stabalizes fluid balances. Attunes to the biorythm clock. full moon. Enhances psychic abilities. Develops clairvoyance. Protects travelers, especially at night & over water.